To be honest, I hadn’t thought much about Emily Dickinson as a person or poet before #508 (above) entered my life. My knowing of her—made of rumors, quips, and her safe verses, sketched only a ghost story. Emily, the virginal, white-wearing, Victorian recluse, sickly, bed-ridden and house-bound, with no purpose but to write strange poems about bees and Jesus then squirrel them away in bedroom drawers to be discovered after death. I found myself wondering about her, wondering what else she knew about living and what else she and I had in common. If you too are interested in Miss Dickinson’s work—be warned. Not all collections of her poems are equal. Her earliest editors, wary that her unconventional capitalization and punctuation, slant rhymes, and spasmodic verse would render her poetry inaccessible to Victorian readers, picked a selection of favorites and “regularized” them (read: reframed/sanitized). For authentic Dickinson, please find The Complete Poems of Emily Dickinson edited by Thomas W. Johnson (SLC Public Library | Find a Library | Amazon ). This publication is the top-shelf compilation of her 1,775 known poems, still spasmodic and arranged, where possible, in chronological order. It is a worthwhile endeavor to read her body of work in one go. Highly recommended by me. Emily emerges from the page to sit beside you as you read. Yes, just a little bit like a ghost. Most poetry is in my opinion too precious. I read poets’ books quickly and unsentimentally pausing only if a verse enlivens me. Dickinson’s poetry spans more than 30 years. That’s a lot of ground and maturation to cover. I didn’t expect to find anything pause-worthy for pages and pages. The stinging beauty of her phrasing stopped me almost poem by poem from the start. By #190 I felt convinced nothing I’d ever been told about Emily was true. So I let him lead me — Home. We didn’t do it — tho’! A search for the definitive Emily Dickinson biography turned up the unimaginatively titled The Life of Emily Dickinson by Richard B. Sewall (SLC Public Library | Find a Library | Amazon ). This book strives diligently to paint Emily using solely her written words or those written by the people who knew her. The biography relies heavily on letters and material evidence concerning Emily’s upbringing, community, education, family, home life, and eventual “discovery.” Sewall’s book is not a storyteller’s biography. It is a long book, dry, often boring, and plainly demonstrates the difficulty of telling the whole truth about any human being, free of the biographer’s fantasy or imagination, based solely on the residue he or she has left behind. 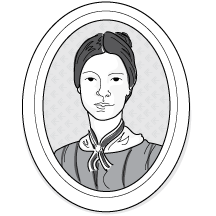 Sewall has assembled an impressive body of evidence, but it is incapable of delivering Emily Dickinson in total. There are long gaps between years, the correspondence is one-sided, and her poetry, being poetry, remains opaque. Sewall leaves it to the reader to draw their portrait of Miss Dickinson. Don’t read Sewall’s biography unless you are willing to do this work. Don’t do this work unless you can be content with your portrait being just one more conjecture for the gallery. Here’s mine: Emily Dickinson was a poet. The circumstances of her life allowed her the privacy, security, audacity, and privilege to pursue and perfect this art form. Emily had an older brother, a younger sister, a father and a mother. Her mother was ill, but her father, brother, and to a lesser degree her sister, were active in the community and the world. Her brother married, and his children knew and loved their aunt Emily. Life transited Emily Dickinson’s home. Emily engaged it as it came, as her family and station expected her to do, later in life as she wanted to do, as she called it to her, and as she crafted it—in person, in letters, and in poems. Emily lived among and within the intimate relationships of her siblings (very complicated and even saucy ones at that) and had sophisticated (and even saucy) relationships of her own. They influenced her and populated her work. She loved and was loved (in every shade), was jilted once or twice. She hated and regretted and mourned and aspired. Emily wasn’t a recluse; she set the terms of her engagement with the world—I believe—to indulge her art. Dickinson was no accidental poet. She was intentional with every written word in letters or verse. She longed to be recognized as a poet and actively sought publication, but also wanted to retain control over her work. When it became apparent she could not have both, that the world would not crown her poet on her terms and in her lifetime, she ceded. Emily became sovereign of her kingdom and titled herself. And why not? Who decides when one is a writer or poet anyway? The one who takes up the mantle—ermine, of course.